Hi friends! This year we are trying BJU Press Distance Online Learning for our high school history curriculum for the first time. Check out the video to see our thoughts on this program! 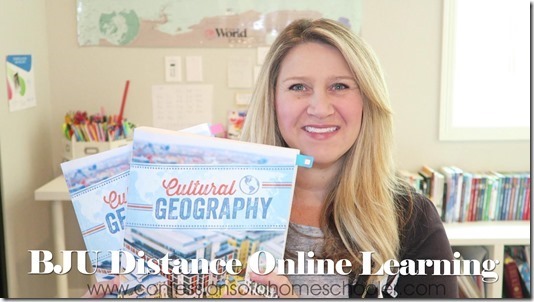 Watch my video of the BJU Press Distance Online Learning program here! So as I mentioned in the video, this is our first year trying out this curriculum and so far we love it! And at this point I do plan to continue using this for the remainder of her high school for history. As I mention in the video, my student logs in to her student account, set up by me at the start of the year. She then does her assignments for the day and informs me when she’s finished. She turns in any activities or lets me know she has a test/quiz. I then log in to my account to grade/check her work from the parent screen. I like to keep her grades in my own grade book, but BJU Press also offers an online grade book as well. And that’s it! With everything online it’s a super easy, no-prep curriculum! You’ll need to head over to the BJU Press Website here and choose the online learning subject of your choice. They offer a variety of subjects and grades. The BJU Press distance online learning program offers you everything you need to complete this curriculum, so you don’t need anything other than what comes with the course. I prefer to get the hard copies of the student workbooks and student text book, but they are also available as online downloads if you prefer! We’ve just found that having a hard copy text book is easier to study from and take notes. But it’s totally up to you and going with the eBooks certainly save on cost. I also mentioned that we use a spiral notebook for note taking along with 3×5 index cards for studying for tests. But that’s totally optional and just something I’ve taught my kids to do! How to Take Effective Notes! Disclosure: This is not a sponsored post, however I am an affiliate for BJU Press and will receive a small percentage if you purchase through my link above. Thank you so much for helping support my blog! Thanks for showcasing this. We used BJU Press Distant Learning last year for many subjects. We chose the DVD option vs. online due to cost. My kiddos were 2nd & 4th graders at the time. Highlight makes me wished I chose the online version instead. My kiddos got bored with the video lessons by mid-year. Having to change out DVD’s also became a daunting task for them and learning became boring. I was surprised my kiddos responded that way with this type of learning format. I had high hopes BJU DIstance Learning would have been more engaging. The teachers portion of the distance learning was overwhelming for me. The answer sheets consumed a massive binder for each kiddo. It was way to much paperwork to organize and access. Maybe that has changed or is different with the online version. I signed up for BJU through an independent homeschool consultant and received a discount and payment plan to make this affordable when buying a complete grade. Which I was pleased with. I might come back to BJU online version when my kiddos can work more independently, as this is great practice for college preparation when it comes to online learning. Also BJU was in the process of updating all lessons in each grade level so we got a mix of old and new. I would be interested to see the new updates. Both my kiddos enjoyed BJU English overall. BJU continues to be a homeschool favorite especially when offering several options with their curriculum. Thank you so much for showing this. It seems like just what we need. I am curious if this is available for 8th graders? And where can I find the fees? I see that we have the option of doing dvds or online…is that correct? This is our first year to have BJU Distance Learning but we are going the DVD route due to internet restrictions. I am so excited to see this what happens this year. Thank you for this review it has been helpful.